La Isla Bonita aka "The Taco Truck" - Yo! Venice! 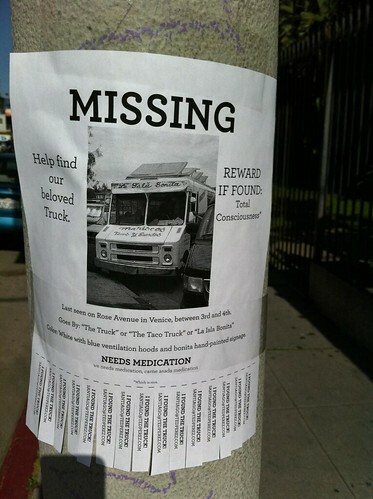 Did you see the “missing” fliers posted on Rose asking where the beloved “Isla Bonita” truck went? Some fans of the truck, concerned that they had not seen it for days, posted the fliers up. All is well and the truck is back. When asked where they had gone, the truck owners replied “vacation”. Thanks to “W” for the picture and story tip, and to Tito too!